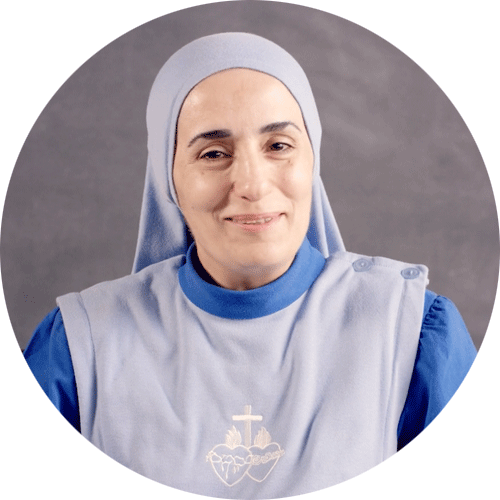 Known as “The Mother Teresa of Baghdad,” Mother Olga Yaqob of the Sacred Heart has dedicated her life to a mission of peace and evangelization. From ministering in war-torn Iraq to serving youth in Boston, Massachusetts, she has spent years answering God’s call to serve those in need. Born and raised in Iraq, Mother Olga lived through four devastating wars. She began volunteering at her church when she was just sixteen, helping to clean the bodies of those killed at war and prepare them for burial. She started Love Your Neighbor, a movement in which Christians and Muslims came together to serve the poor. She later founded the order of Marth Maryam Sisters, Missionaries of the Virgin Mary. Mother Olga also worked in pastoral ministry for youth and college students in various parishes in Iraq. She received the Humanitarian Award in recognition of her dedication to the poor and suffering. Mother Olga came to the United States to earn a master’s degree in Pastoral Ministry from Boston College. She worked in campus ministry at Boston University’s Catholic Center and founded the Nazareth House on campus, a place where women could gather to pray and listen to God’s voice in their lives. She became the university’s chaplain and established the Daughters of Mary Nazareth, a new religious order in the Archdiocese of Boston. She currently serves as their superior. Mother Olga was recognized multiple times for her evangelization efforts in Boston. These include being named Religious Sister of the Year in 2008 by the Boston Catholic Women’s Conference, receiving the Saint Paul the Apostle Award in 2010 from the office of the New Evangelization of Youth and Young Adults of the Archdiocese of Boston, receiving an honorary Scarlet Key Award in 2011 from Boston University, and receiving the Bowie Kuhn Special Award for Evangelization at the Legatus 2012 Annual Summit.